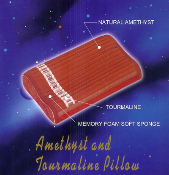 This pillow is made from elastic polyurethane memory foam originally developed for NASA. Made with both Amethyst and Tourmaline. This pillow will keep your head cool while enjoying the Biomat. Order from this page only if you are shipping the product to the continental United States or Canada. If you are shipping to anywhere else, go back to the Other Products section and choose the area to which you are shipping the product.